I’ve always liked fish tacos, but they’re one of those things that should be healthy, but usually hides a lot of unneeded calories. So I tried my hand at making some without a lot of creamy, fattening sauce, and I found that salsa verde really does the trick. All I did here was combine an old family favorite quesadilla recipe with fish sticks and vegetables. I’m really happy with the results, so I hope you will be too. It’s a fast recipe, so you’ve got to be on your feet if you want to get everything done in less than half an hour. Unlike a lot of other “half hour” recipes, this can be done, making this a great dinner for school nights. Preheat the oven to 425 degrees. Put a sheet of aluminum foil on a cookie sheet and spray with nonstick spray. Arrange fish sticks on the sheet and bake for 22 to 24 minutes. In the meantime, take a tortilla shell and place it on a skillet over medium heat. Spread 2 Tbsp of salsa verde on the shell with a spoon, then sprinkle with 1/6 cup (that’s 2 Tbsp and 2 tsp) cheese. Cover and heat until cheese melts, about 4 minutes. Remove from heat with a spatula and put on a plate. Repeat with the other 3 tortillas. 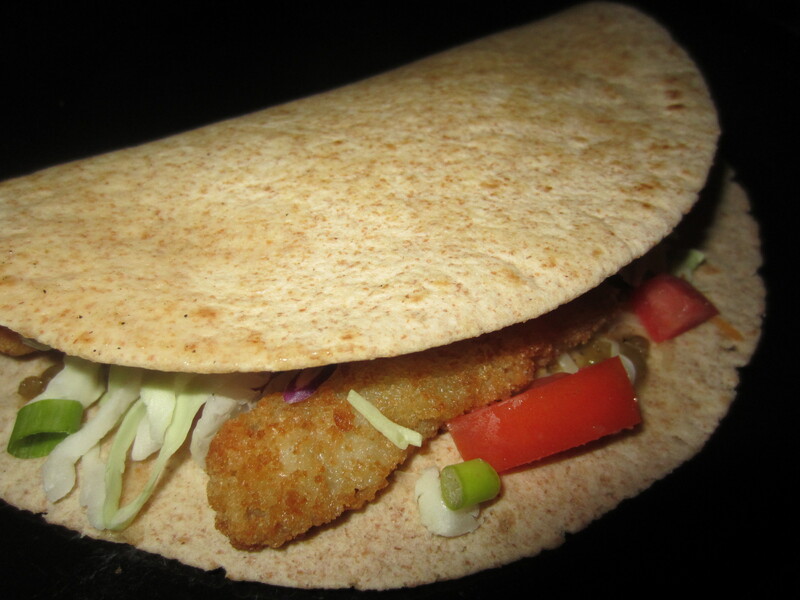 When the fish sticks are finished, put 4 on each prepared tortilla and sprinkle with tomato, scallions, and cole slaw mix. Fold tortilla in half and serve. Quasadilla in the skillet, before adding the fish sticks and veggies. You can always serve the quesadilla like this, by putting it on a plate, and pressing it in half. 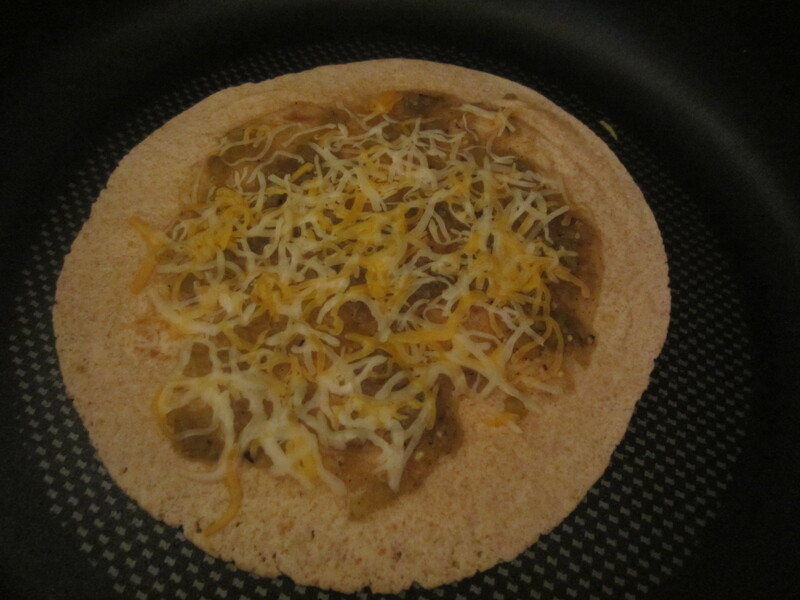 Or, you can add pre-cooked, shredded meat for a beef, pork, or chicken quesadilla. Jenny Craig: This would make a great dinner entrée. This looks delicious!!! I can’t wait to try it! Do you think there would be less fat if I baked a white fish like halibut with just some pepper and salt? Then you can seperate it like you would pulled pork and add it to the tortillas. That way you avaid the whole breaded fish (as delicious as it is). Just an idea! I think that’s a great idea. I honestly wanted to do something that readers might see as simple, such as baking fish sticks. Some might be afraid to throw fish under the broiler or into a skillet. But I completely agree with you that using a white, non-breaded fish would cut the fat down and still be delicious. The flavor of the salsa verde should do the trick either way. Next Next post: Happy Harvest Season!